A style of punishment which was popular in medieval Europe, as well as some Asian countries. This presents itself as an extremely simple and cheap method of killing a victim accused of witchcraft, adultery, murder, blasphemy, or even theft. In the Roman Empire they sawed their victims in half, horizontally. The more inventive Chinese decided to hang offenders vertically by their feet between two stakes which had been driven in the ground. Such situations allowed the body to remain awake during the torture, even conserving blood loss due to the constant inflow to the brain. 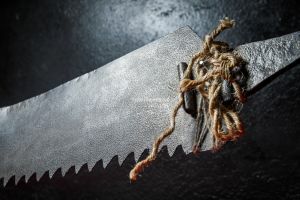 A man could stay alive until the saw reached his waist level, or sometimes, chest. 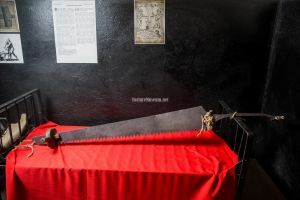 Due to the method’s simplicity and the unpretentious nature of the execution, death by sawing was widespread during the time of the Inquisition. It was often employed on witches and sexual minorities. In getting those inquisitioned to talk, executioners could force him to watch as he was slowly and painfully being sawed into pieces. An interesting fact: Caligula was distinguished to have had a particularly perverse bloodlust. The emperor ate whilst watching bloodied and disfigured bodies being sawed apart, saying that the suffering served as a snack. Some of his relatives died at the hands of a saw. Look at this! Why are you turning away? It’s not every day that you get to see an adulterer get their fair share of retribution! It’s actually nothing crazy at all, the fact that thisn man is hanging by his feet— Nope, this isn’t punishment at all. He’s been stripped of his clothes so that the saw’s path won’t be impeded. Yes, indeed you’ve guessed it, they’re going to carve him up. Manually. Originating from China, these executioners are not used to showing any emotions, especially whilst on duty. Where is prisoner’s right hand? 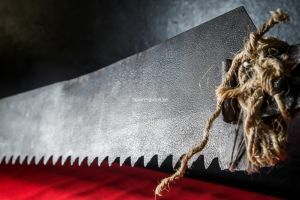 It was used to check the sharpness of the blade. The edge cut through his bone as it would a branch of a sapling. In order to cauterize the veins and reduce blood loss, the executioners immediately burned the cut with a torch. The head-first position aids in this matter. Now our craftsmen extend the saw between the prisoner’s legs, taking him by the hands. What, you don’t want to watch? Too bad! With one juicy cut of the saw’s teeth, a hunk of sinful flesh is sawed off. Blood streams down along the legs, over the stomach, then the chest, and trickles off his hair on to the sticky floor. Why doesn’t he scream? He doesn’t have the strength. His hip bones already cracking, the saw meets its first substantial obstacle — the pubic bone. It’s similar to sawing through a log, but in place of wooden shavings — crimson spray. It is better to die at once than feel the metal blade within your innards, but not all prisoners are so lucky. The saw slowly cuts the body parallel to the spine, becoming slightly stuck in the chest. The legs of the executioners are flooded with a homogenous mass of human sewage. The body shakes with one last convulsion. Undo the binds, and bring on the next one!